Last Week Tuesday December 30, we told you about the story of the Dam that was built in Barton Creek, apparently without permission from the Department of the Environment. We will play the original story in case you missed it last week. Many Belizeans know of the ATM cave; Actun Tunichil Muknal , as well as the cave at Caves branch , also in the Cayo District. The Dark Knight story, which aired recently in the media, showed the plight that local tour guides have in accessing the cave location in that property. PlusNews travelled to Barton creek, a Mennonite community, now owned by a few wealthy Canadians and Americans. Deep within this lush forest and farming area is a tourist destination known to just a few Belizeans; The Barton Creek cave system is comprised of well over 5 miles of caverns with an entire mile accessible to tourists for canoeing and sightseeing. The cave was used by the Mayas for ceremonies and when combined with the Mayan pottery, bones and stalactites and stalagmites it has become one of the areas protected and administered by NICH. A NICH protected area comes with its own regulations, and as this sign demonstrates ; there is a lot you cannot do. And if you do it; there must be the proper EIAs and permission from the relevant departments. So it was quite a surprise when we found a dam built almost at the mouth to the entrance of the Barton Creek cave; it’s found at Mike’s Place owned by one Mike Bogart. His website claims the caves are on his private property. But just downstream from this dam is another one, much bigger, one that diverts almost the entire Barton Creek itself on to the private property leased by one Ian Anderson. His neighbor is Karina Tylor and she told us that upon her return from the US, she found it just upstream from her property. “If they built the first dam further up the river to slow the flow of water. I spoke to one of the men that said that they were actually diverting it off into his land. It was just flooding his land, and I couldn’t understand why they would do that. Where the old river used to flow is nothing but rock, and there is a brand new river now that’s been cut into his property, with a very, very large dam and an electric wheel, like a powerhouse. The stream used to run in one flow. There was no island. It used to run to the west, ’cause north is behind you. That would be west over there, and the entire creek used to come down through the west side of this island. It seems that they’ve built a dam, and they’ve diverted the water up here to this powerhouse, where there’s a big water wheel, and the original concrete pillar is sitting in the middle of this island, as though it was placed in the middle of the water. This island was never here. They pulled in a tractor from Esperanza. I forget the man’s name. He diverted the river from up top over to the left into this man’s yard. They built support walls. This dam has been built with concrete and rock. They’ve totally changed the flow of the water. Even the colour of the water is changed. Theodore “Pappy” Lennan, a former Tour guide, says that these structural interventions are changing the character and flow of the water, and in an area where all access to the Barton Creek caves are private, only the creek itself is truly public access. Now that has been blocked. “About twenty years ago we used to access the cave through the river, ’cause at that time the Mennonites didn’t have a road to go up. So we used to stop right by where you’ll cross the river with a vehicle now, and we used to go up the river with the canoes. Before that we didn’t have any diversion. It used to be one straight [stretch] and the current was a lot higher. The water was higher. By them putting a dam on the river, it did a lot of change. Karina has spent 12 years living in Belize and says that she is observing that Belizean locals are losing more and more ground to these expatriates she calls “immigrants”. “The people [have] to stand up, because if they don’t this isn’t going to be Belize anymore. It’s going to be Little Canada or Little America. All of these immigrants are coming to the country, and they’re taking away the Belizean right of using the public access ways, which is 66 feet from the right and the left of the creek to each side. They have signs up. They have gates up stating ‘No Entry’ or ‘Private Property’. They’re closing access roads. Since visiting the area for ourselves last week, PlusNews contacted the Department of Environment who informed us that no permission had been given to anyone to build a dam on Barton Creek, much less alter the flow and direction of the Creek. They requested and we submitted to the department, video footage of what we had encountered and we have been informed that the Department has since sent a crew out to the community to investigate the matter. We are now awaiting an official response from the Department and will keep you posted. On Tuesday, we contacted the Department of the Environment to get an update, and they told us that while the crew did find the dam at Mike’s Place, they could not find this larger dam. That dam diverts the flow of the river, and as a result, cuts into the property of Ian Anderson where a hydraulic system was built. Plus News understands that a meeting will be taking place in Belmopan on Wednesday, between the Department of the Environment, Mike Bogart, and Ian Anderson, as a result of PlusTV’s story. The Department of the Environment has also promised us an interview sometime this week. For over the past few weeks we have been reporting on the construction of an apparently illegal micro hydro or water mills in the Barton Creek Area, very close to the Barton Creek Cave. We took the information to the Department of the Environment who sent at team there to investigate the reports. After that, the department had discussions with the two owners, Mike Bougart and Ian Anderson, to listen to their side of the story. At the conclusion of their preliminary inquiries, here is what is what the Department has gathered. “At this point we’ve determined that they cannot show any proof that they have permission from any Government agencies for these structures. We’ll be conducting a joint inspection this week, and then when we come back we’ll sit as a group and decide what we will do, and we’ll look at these type of issues. We need to [know] how long they’ve had ownership of the property, and how long these structures [have been] there, and to see if they are the legally responsible persons for that. Bu, in any case, all of these things should be ironed out during the joint meeting and the discussions with other agencies. Anthony Mai,, explained to us the regular procedure of attaining an environment clearance from the Department. “For something like this whenever you want to use water resources, there are legal permits and approval that you need to obtain from the Department of the Environment. It’s an environment interference. That [means] you’ve been granting permission from the Department of the Environment to use the natural resources, and use it in a sustainable way. What they should have done is to come into the Department, [and] provide us with a description of exactly what it is whey want to do. They have a unit dedicated evaluating projects, and so that unit would have screened it, evaluated it, and then move forward with it. At the end of the day, if the negative impacts to the environment would be low, and the positive outcome of it would be high, then the Department would say to you to go ahead and construct the structures, but you have to do it in this way. The Department could not tell us what disciplinary actions, if any, will be taken against the owners of the two structures as they are yet to meet with the multifaceted body next week to discuss the way forward. “The Department of the Environment is always here, looking after environmental related issues. If anyone in the general public has information about any type of structures related to a micro-hydro within their area, and would like to notify us of that, you can definitely call in. In the December of last year, we reported about a dam that was built on the Barton Creek less than a mile downstream from the entrance of the Barton Creek Cave, an archaeological site protected by NICH. 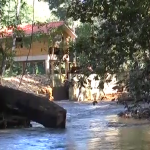 The Department of the Environment confirmed that they had not authorized the construction of the dam, and have since launched an investigation to determine the person responsible for the construction of the dam. 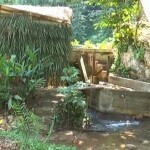 The Dam sits on a section of the river that runs adjacent to a property leased by one Ian Anderson. But according to Mr Anderson, the dam structure was already there before he leased the property, and he only made minor modifications to the powerhouse. However, according to Karina Tyler, the neighbour of Ian Anderson, that is not the case. “I know that on Facebook and in other areas Ian Anderson has made a comment that he refurbished an old standing dam that the Mennonites had build years ago. That is absolutely untrue. There are many people who swim there. That dam has never been there. That waterwheel has never been there. I’ve been there twelve years almost now. I even went and I spoke to one of the Mennonites, and I asked them if they built that dam, and he said absolutely not. “That’s odd, because I think the previous owner on paper is still the owner. Her name is Sharon something, but she had a family there for many years by the name of Jim and Jacquelyn Britt. Jim and Jacquelyn had a camping site there. They did backpackers and other things. They’ve left the country, so I’ve not spoken to them. But I do know as a fact that the dam was not there when they left either, because I did spend several days on that piece of property after the Britts left and Mr Anderson had purchased it. Jim and Jacquelyn Britt is a couple from Nashville Tennessee who lived in Belize from 2004 to 2013 in the same property now occupied by Ian Anderson. Carl Churan, an American geographer by trade, says he has been in and out of Belize over the past 15 years and claims to be a personal friend of the Britt’s. “I got sick in the creek by swimming in it, so I would say at least two years. I myself was physically out of the country. We made a quick search on the internet for Barton Creek outpost San Ignacio and came a across a number of images showing the old flow of the River. The images you are seeing now were uploaded to the internet sometime between 2010 and 2012 . We can’t tell you exactly when they were taken, however one quick look will tell you there is no dam present in those images. Now looking at some of the images from our trip to Barton Creek in December last year, you will notice a distinct difference in the water levels. Also notable is that a large rock formation on the left hand side of the river going down stream is no longer there. The department of the Environment continues to investigate the dam at Barton Creek and have engaged other Government Departments in the investigation. The Barton Creek is a popular tourist destination, and while the rise in water levels near the Barton Creek outpost is not directly affecting tourists, it does affect the locals who live down the river. The locals of 7 miles have used the water from the creek their entire lives, using it for washing, fishing, swimming and doing other recreational activities. “We’ve been visiting that river all the weekends when we were living in 7 miles. While we were down there living, we fish at night. We paddled on canoes. This time all of that has come to an end, ’cause they’re changing everything. Now today, there is a dam that wasn’t there. “When Jim and Jacquelyn were there, I visited the campsite often, had drinks and food, and I swam there, and there wasn’t any dam there, and that was recent. We also spoke to another local who claims to have been one of the persons employed by Mr Anderson last year to work on the construction of the Dam. He chose to remain anonymous for this interview. “I was a resident of 7 miles for the past nine years. 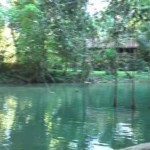 During the dry season we used to go down to Barton Creek to have a swim down by Outpost, by Jim and Jacquelyn. My wife used to work there also. We usually swim down the creek, and we go fishing. We used to fish the river shrimps, and there was no dam there. I used to work with Ian last year. We helped finish the dam there, by maybe late November, late December of last year. Whatever he said about some Mennonites, that they build the dam, that dam was not there. He claims he started working on the dam in mid November but a friend of his started working on the dam from the onset. “He started working there before me. So he knows who worked there and who didn’t. “[It started] like around June of last year. I think that that dam doesn’t belong there, because we don’t have no more access to the creek. Actually that’s a private place now. “I would strongly like to voice out my opinion, that it is wrong what they are doing. The creek is no longer open for the Belizeans. In my opinion, it seems like it’s their private creek, ’cause why are they doing what they want? The men made an official statement at the Department Of the Environment on Thursday. On Friday an officer from the Department of the Environment informed us that they will be meeting other residents in the area early next week.